The steeple of the landmark Notre Dame Cathedral in flames. 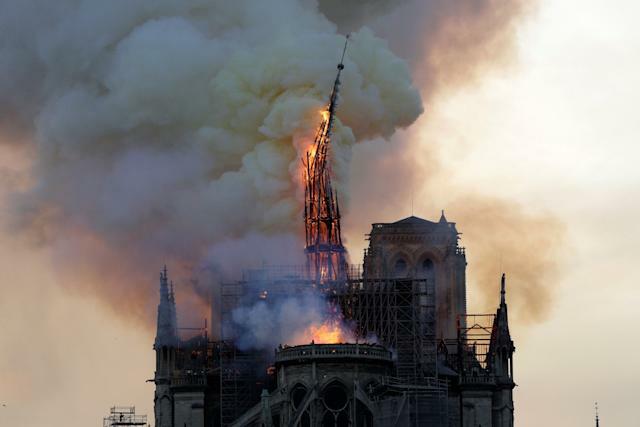 A massive fire broke out at Notre Dame Cathedral in central Paris on Monday afternoon, sending flames shooting out of the roof of the Catholic landmark and toppling its iconic spire. The cause of the blaze is not yet known. There were no immediate reports of injuries or fatalities. Fire officials told Agence France-Presse that the fire was potentially linked to the renovation of the building. Scaffolding could be seen ablaze on the roof of the famous façade. Church spokesman Andre Finot told French media that the fire cathedral’s frame was also aflame.